Background and Purpose: Nowadays selection of resonant raw material in forests is not practically carried out; there are no standards and samples for a tree with such timber, and, consequently, rational target use of this unique natural material is not achieved. Thereof a lot of valuable wood remains in forests or is harvested for utilizing as general-purpose forest products or firewood. The research is focused on the studies of interrelation of resonant properties of wood and its biomorphological attributes such as crown diameter and height, trunk habitus, branchless zone extension, etc. Materials and Methods: Test material for the research of dendroacoustic parameters were cross-section radial cores 4.0 mm in diameter selected with an increment borer at breath height from 16 model trees after cutting them down. Simultaneously, diameters of trunks at relative heights (H) of 0.2Н, 0.5Н and 0.7Н, as well as branchless zone extension and tree crown parameters (its extension, first alive knot fastening height, etc.) were defined. Then, the interrelation was revealed between the biometric data of a tree trunk and average sound velocity measured across the trunk with UK-14П ultrasonic device at different relative heights. Results: The results submitted in this paper present practical value and assess the accuracy of standing spruce wood resonant properties' forecasting based on its ‘wood study portrait’ parameters. Conclusions: Acoustic properties of wood depend on biomorphology of a tree as well. The parameters of stem tapering, trunk volume and especially branchless zone extension and crown elevation have, to any extent, the greatest practical value for standing resonant raw material express diagnostics. Wood quality is initially predetermined by the biology of a certain tree, including the breed and other hereditary-genetic, i.e. 'intrinsic' biotic factors. In the process of growth and development, a tree cannot remain indifferent to the influence of all external, abiotic factors influencing wood quality as well. These can be soil-climatic conditions, changes of light and temperature modes in the action of the planting itself, consequences of human intervention into the forest’s life by its thinning, all types of reclamation, etc. After all, wood quality is formed under the complex action of internal and external factors [1-3]. Individual-genetic (hereditary) factors undoubtedly prevail in wood quality formation in general, not to mention the features of physical and mechanical properties, macro- and micro- structure. Despite the substantial polymorphism of spruce trees, hereditary factors prove themselves as rather stable through external biomorphological attributes of a tree: type of branching and crown form, bark color and structure, trunk habitus, etc. [1, 4-8]. It is impossible to find reliable data on the use of these attributes by Stradivari and other masters of the Old Italian school in selection of wood for manufacturing unique musical instruments. However, it is wrong to exclude this, as later and modern ways of standing resonant wood quality by visual estimation apply the above-mentioned attributes. Other important factors are visual appearance and tree condition. Among modern masters there is a point of view that a spruce tree selected for the manufacturing of musical instruments should meet the following requirements: it should (a) be absolutely vertical; (b) have symmetric, narrow and spiry crown; (c) have a trunk with a cylindrical surface and branchless zone not less than 5-6 meters; and (d) not contain other visible defects and damages. Thicker trunks are in demand: if the diameter at breath height is less than 35 cm, i.e. at the age of less than 100-120 years, the use of such a tree as a source of resonant material  is considered counterproductive . It is not difficult to guess that such requirements for a 'resonant' tree are imposed, first of all, by technological and economic reasons, considering maximal output of industrial assortment and parameter limits of the assortment for manufacturing decks of a musical instrument. Grapini  specifies more detailed data for resonant spruce: (a) the crown is in the form of a column, almost symmetric, gradually decreases from the basis to the top at an angle of 30-40° and is formed by thin branches running mainly downwards; (b) the branches from the third part of the middle and the bottom of a crown are attached to the trunk at an angle of 30-40°; large branches are arranged in clusters, and besides there are branches outside the clusters as well; (c) the second order branches are rather rare, thin, long, hanging down, ash-gray-green; (d) the third order branches are also rare, thin, but light green; and (e) needles are evenly distributed along the branch, but are never heaped up at the top, as in some forms of spruce. A lot of individual masters also consider descending branches to be an attribute of a resonant spruce [7, 8, 11]. Special value is set on the fact that it 'is not warped'. It is determined by attentive inspection of the tree from the view point of branch clusters arrangement, bark cracks, etc., which requires considerable experience. Furthermore, bark structure and color are morphological attributes of spruce that are often used by masters selecting the material for manufacturing musical instruments both on root and in round assortments. However, there is no general opinion about any specific attribute undoubtedly acceptable as a diagnostic one. This is probably related to strong variability of the attributes specified, which also correlate with biological and ecological features of individual trees . Imperfection (or even absence) of a uniform method of express diagnostics of standing wood acoustic properties is caused by the elements of subjectivity in conclusions based on the results of observations by different authors, especially regarding different soil, climatic and geographical environment. According to Redulescu , the bark of a resonant spruce-tree should be grey and should consist of rather small and smooth scales. Gavris  and Yablokov  also recommended the selection of plus spruce trees with smooth bark forms (lowland, as the authors confirm) as resonant. Bagayev and Alexandrov  believe that smooth-barked spruce-trees with narrow crown of both Norway and Siberian species have the best resonant properties. Sankin  conducted a thorough study on the relations between variability of macrostructure, anatomical structure of wood, and physical, mechanical and acoustic properties depending on spruce tree bark appearance in the environment of the Vologda Region of Russia. Having studied the trees of two groups (with platy and scaly bark), he came to a conclusion that spruce with scaly bark is preferable since it possesses greater genetic plasticity. Meanwhile, the relationship of late wood percentage and annual ring width with wood density, dynamic modulus of elasticity and acoustical constant is equally strongly expressed in both groups. Basing on such biomorphological preconditions, some scientists consider that there is a certain phylogenetic biotype of resonant spruce [11, 13]. To prove this hypothesis it is possible to recall a well-known fact: not each tree, even of the same breed and within a particular taxon, possesses necessary wood dendroacoustic parameters; in other words, 'musicality' of one tree does not guarantee that all trees of the same breed in the neighborhood have such wood. Therefore, studies represent not only theoretical, but also concrete practical interest for the selection of qualitative material for manufacturing musical instruments. When searching for an objective biomorphological attribute, we decided upon the seed scales on trunk habitus and tree crown parameters. Test material for the research of dendroacoustic parameters were cross-section radial cores 4.0 mm in diameter selected with an increment borer at breath height from 16 model trees of spruce (Picea abies (L.) Karst.) at the age of 120-140 years. They were selected in the north of Kirov region of Russia after having been cut. Simultaneously, diameters of trunks at relative heights (H) of 0.2Н, 0.5Н and 0.7Н, as well as branchless zone extension and tree crown parameters (its extension, first alive knot fastening height, etc.) were defined. The method of standing resonant wood revealing against the cores has been introduced abroad  and in Russia  relatively recently. As a rule, wood structure is different along the length of a radial core and, accordingly, wood physical and mechanical parameters in medullar parts and in sapwood are also different. This distinction is well noticeable even with a naked eye, first of all, when judging from wood macrostructure: narrow annual rings are in trunk peripheral zone and wide ones are close to juvenile central zone (Figure 1а). Rather homogeneous wood between undercork and near-core zones is usually taken for deck manufacturing. In view of this, we studied this part of a trunk along the radius, conditionally denoted on cores as a 'working' zone (Figure 1b). FIGURE 1. PGeneral view of wood macrostructure according to the trunk zone: a) elements of wood macrostructure (EW - early wood; LW - late wood; AL - annual ring); b) scheme of core division according to zones (N - near-core zone; W - working zone; U - undercork zone). 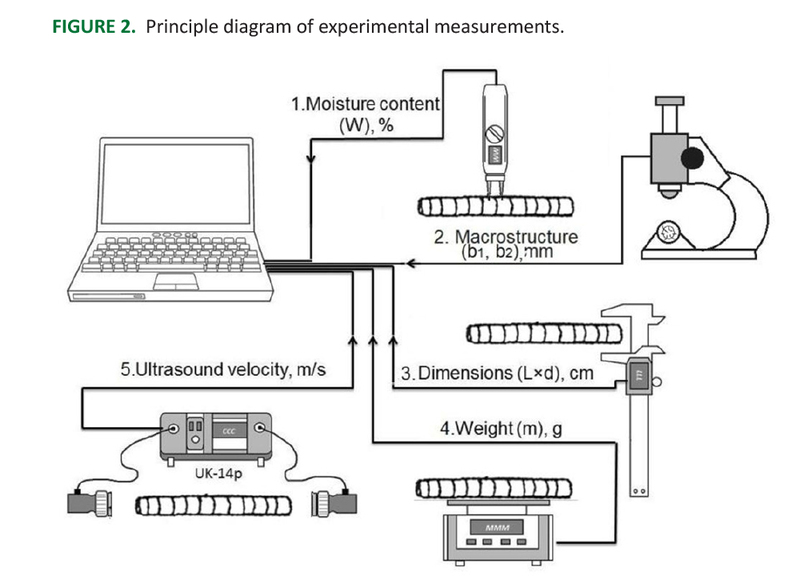 Basic physical and dendroacoustic properties of wood – humidity, density, macrostructure, and ultrasound velocity – were defined in laboratory environment. The research was carried out in the laboratory of resonant wood qualimetry of the Volga State University of Technology. To ensure the accuracy of performing ultrasound studies the samples of wood were kept at standard conditions, i.e. at 20°С and relative air humidity of 65%. The general order of complex research is presented in Figure 2. FIGURE 2. Principle diagram of experimental measurements. The macrostructure of wood was studied with an electronic dendrometer, whose principle of action is based on the assessment of early (b1) and late (b2) wood zone width in annual rings according to their microhardness . It should be noted, that 60 kHz piezoelectric transducer optimal for wood study was used in the device. Threshold value is K≥12.0 m4·kg-1·cm-1 for resonant wood in a longitudinal direction along fibers, and under cross-section radial measurements K≥3.5 m4·kg-1·cm-1 . Thus, the physical essence of resonant wood represents combination of incongruous properties, i.e. high parameters of rigidity, sound velocity and low density. Over the last years scientists around the world have become more active in studying acoustic and elastic properties of coniferous wood, both standing and in assortments [2, 17-19]. However, they do not touch upon the interrelation between acoustic properties of wood and biomorphology of a tree. We studied the influence of absolute and relative tree morphology parameters on average velocity of sound in a trunk. Tree height, crown diameters in latitudinal and longitudinal directions and their mean values, branchless zone extension, height of the first alive knot fastening, alive crown extension, and alive crown relative extension are submitted here as input data. 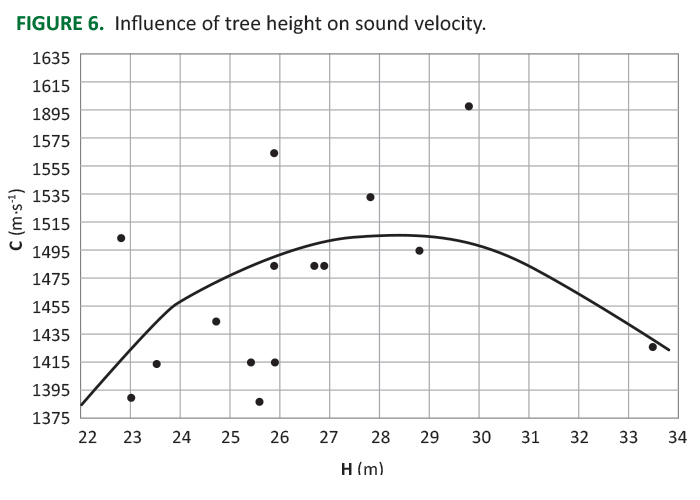 As shown in Table 1, average sound velocity across a trunk has rather low factors of linear correlation with tree morphology parameters; besides, their reliability does not exceed 70%. The factors of linear correlation (Table 1) characterize the interrelation between sound velocity in stem wood along fibers and the corresponding biomorphological parameters. This was obtained by using data correlation analysis. TABLE 1. . Linear correlation coefficients of sound velocity across the trunk with spruce morphology parameters. Although the correlation coefficient is small, the para-meter of correlation of sound velocity with branchless zone extension (r=0.334) and with first alive knot fastening height (r=0.282) stands out among the presented parameters. Such tendency corresponds to the rule which masters have used for a long time, providing the selection of resonant spruce with highly lifted crown. In a certain degree, it is also proved by negative correlation of sound velocity with relative extension of a crown (r=-0.177). However, in this case, the opinion of masters regarding the trees with narrow crowns as the best source of resonant raw material has not proved to be true; the correlation of sound velocity with crown diameter appeared positive. Further calculations showed that rather low values of the given coefficients are somehow accounted for by nonlinear character of the relationships under consideration. Therefore, further analyses are graphically presented on the basis of quadratic equations. Apart from the tree morphological parameters listed, we shall also consider the influence of average stem taper and trunk volume on sound velocity in wood across fibers. Here the parameters of branchless zone extension Lb and crown relative extension Lc/H stand out. Quadratic equations of their influence on sound velocity appeared significant among all other parameters of tree morphology and they are expressed accordingly (Figure 3 and 4). FIGURE 3. 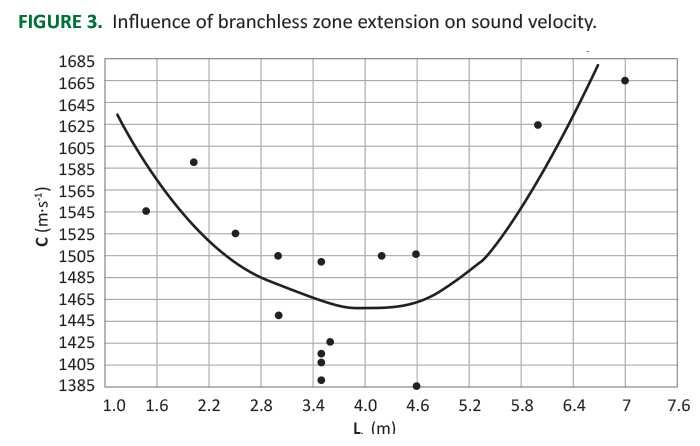 Influence of branchless zone extension on sound velocity. FIGURE 4. 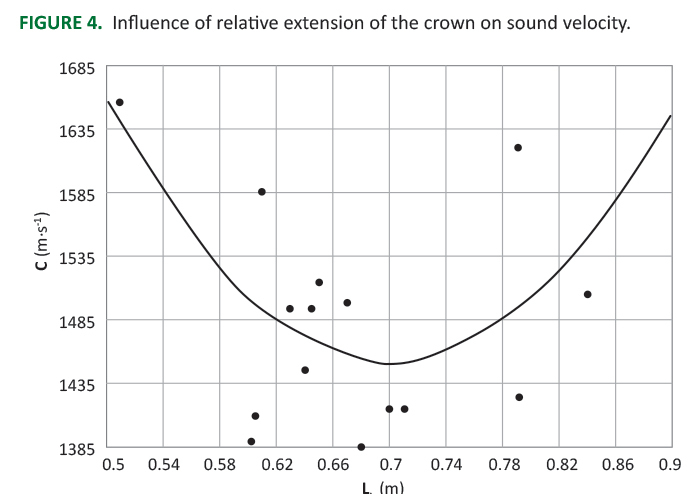 Influence of relative extension of the crown on sound velocity. The influence of alive knots fastening height (Figure 5) and tree height itself (Figure 6) on sound velocity are of special practical interest as well. FIGURE 5. 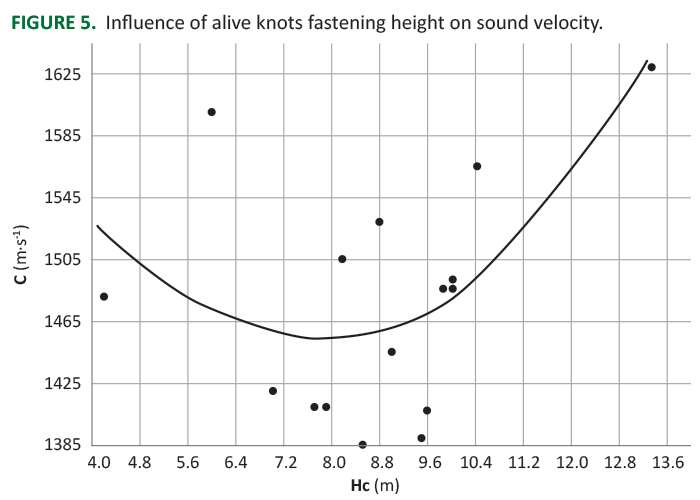 Influence of alive knots fastening height on sound velocity. FIGURE 6. Influence of tree height on sound velocity. FIGURE 7. 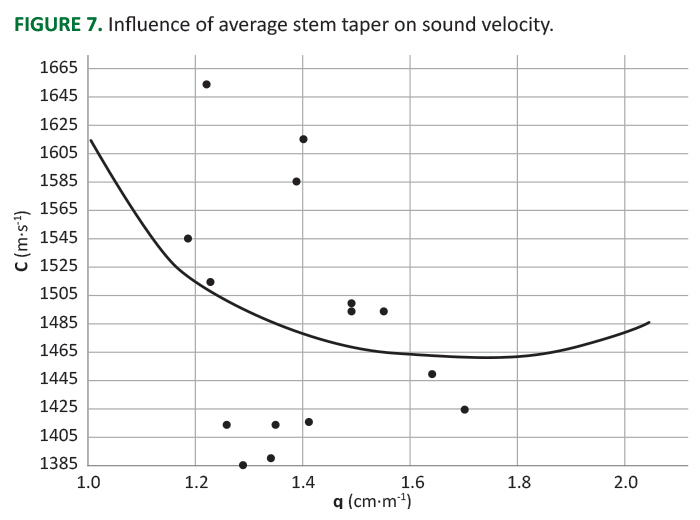 Influence of average stem taper on sound velocity. Despite the insignificance of the regression equation against Fisher's variance ratio, the nature of approximation line allows to question the weak influence of average stem taper on cross-section sound velocity in wood. However, the tendency remains that the less tapering trunks have relatively better wood from the viewpoint of acoustic parameters than the more tapering ones. Basically, this corresponds to standard resonant raw material selection rule in denser stands where full-bold trunks with smaller taper are formed. Trunk volume (V, m3) has the nature of influencing sound velocity rather close to the diameter; maximum velocity is observed at its certain interval, outside which, both increasingly and decreasingly, there is a reduction of the given acoustic parameter value (Equation 9, Figure 8). FIGURE 8. 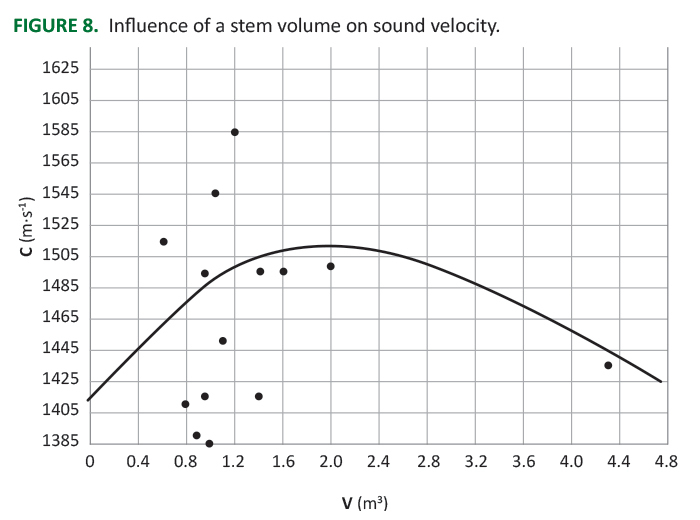 Influence of a stem volume on sound velocity. It is necessary to note a sufficiently high degree of data dispersion, which is presented in the diagrams (Figsures 3-8). It also characterizes insignificant correlation between sound velocity and biomorphological parameters. The graphs were built using computer modelling. The given type of a regression model was chosen as the one most adequately describing all the dependences under study. Acoustic properties of wood depend on biomorphology of a tree as well. The parameters of stem tapering, trunk volume and especially branchless zone extension and crown elevation have, to any extent, the greatest practical value for standing resonant raw material express diagnostics. № 2130611 RF. 1999 Method for and device for diagnosing wood resonant properties. FEDYUKOV VI, Veselov LN, VESELOV VL. – RU 97109185; appl. 28.05.97; publ. 20.05.99; Bul.of invent.– No. 4. UGOLEV BN 2001 Wood science with basic concepts of timber merchandizing. MGUL, 340 p.